Wow. Wow. Wow...you are blessed! This is one of the most beautiful pictures I've ever seen! Oh, that is a beautiful picture. How lucky you are to have this. Enjoy! That is a gorgeous photo! Wow! Beautiful! Now, this picture can hang on the wall next to the other one. You need to size that up, print it and show it off at the local fair! Beautiful! Have an awesome day, Farmgirl! Man, that must have been some kind of luck catching that in mid flight! I see now why you love your camera. I guess what I'm trying to say is, HOLY MOLEY is that a beautiful picture! I'm a quiet observer of your blog who just couldn't keep my mouth shut this time. Your website is my favorite and I visit almost every day. I love your photos, you live on my dream farm, and your a fantastic lady for doin what you're doin! Thanks for sharing with the rest of us. 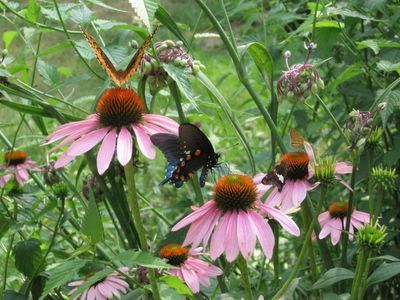 I didn't even see the orange/brown butterfly at first. The dark one is so amazing. Great photo. Nice photo! 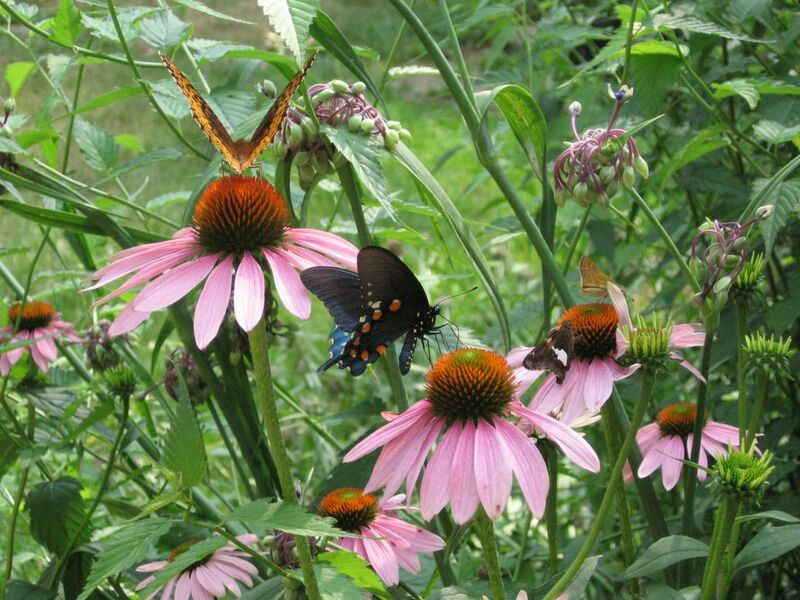 It looks like your Echinacea AND butterflies are in abundance! What a beautiful pic, Susan! Your conflowers are lovely!